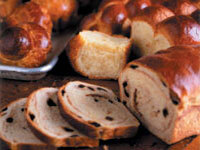 Brioche dough is very versatile. It makes lovely bread, cinnamon rolls, sticky buns, dinner rolls, dough nuts or other sweets. The bread can even be used for bread puddings and French toast. Combine flour and yeast. Add eggs, milk, sugar, and salt; mix on low speed for 4 min. With mixer running on med. speed, gradually add butter, scraping sides of bowl as needed. After butter is fully incorporated, mix on med. speed for 15 min., or until dough begins to pull away from sides of bowl. In the final minute, add raisins, and in the last 30 sec. add cinnamon to create a swirl. Place dough on a sheet pan that has been lined with greased parchment paper. Cover tightly with plastic wrap and refrigerate overnight.